This Shambhala bracelet version is pure Bling without the Ding, dressy or casual, fashionably chic. 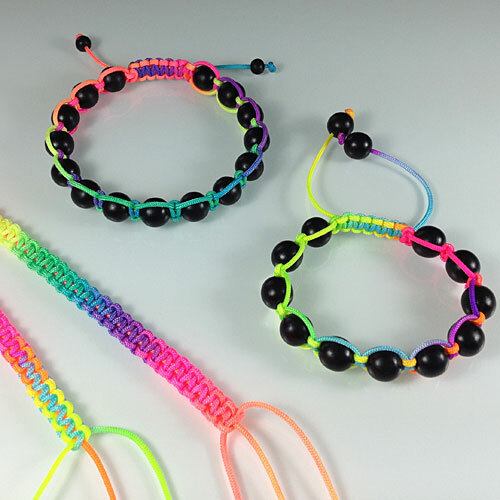 These bracelets are fun, easy to wear and quick to make. I made and sold many variations at local markets in the search for the perfect design. I ended up streamlining the stringing, the knotting process and coming up with my own variation - at least one I had not seen anywhere else yet. My customers loved this version as it is easy to put on and take off by oneself, and some of the problem that occur with the sliding closure are been resolved... The instructions have diagrams showing knot and bead placement and sizing tips, plus the traditional floating square knot slide. The kit comes with two extra beads for larger size bracelets. If you have not made one of these bracelet yet or want to learn my techniques, get a kit or the PDF instructions by themselves. These kits are not intended for children jewelry. Need to know how to knot Overhand & Square Knots & agree with copyright terms! minus the instructions, and tools. 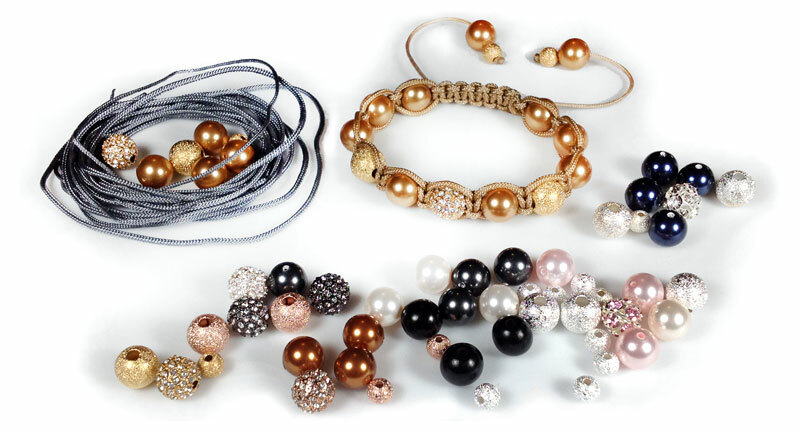 Kits include Swarovski Crystal Pearls, Beadelle Pave Beads or Rhinestone + Stardust Beads with various finishes, silver, gold and copper tones as well as antique patinas or Ebony Beads (B/W). Chinese Knotting Cord may include Medium/Fine Weight or 1mm/Extra Fine combination. In addition to the materials included in the kit, you will need scissors, a macrame board with T-pins and/or mini-clips or an alternative boards such as a clip board, a bead tray, cardboard or foam board, plus a Super Max Thread Burner. A lighter is an alternative to the thread burner. An electric reamer is recommended if you are going into production. These tools are not included in the kit. This will take you directly to a Paypal checkout payable with any major credit or debit card. Once your payment is complete you will be redirected to a web page with the link to the PDF and the password. Save the password and bookmark the page for future viewing. Please Note: These instructions are copyrighted and are for personal use only. If you would like to use these instructions to teach, either buy a set of instructions per student or get kits for each student. Do not duplicate this document either in print or in an electronic manner. When purchasing this PDF, it is assumed that you agree with the terms of the copyright of this document. 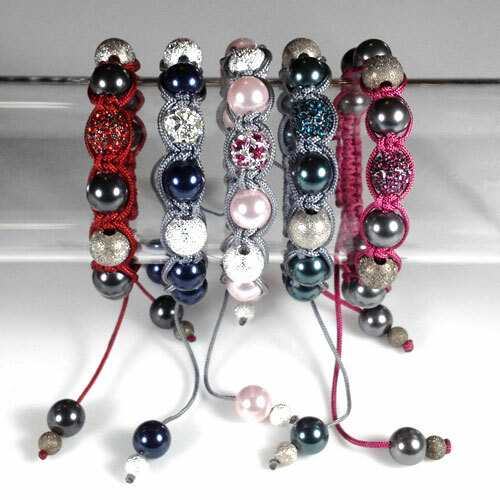 As to bracelets make as many as you wish - it is a traditional design adaptation. See additional note on copyright. Thanks for understanding! His & Hers Surf Shambhala Bracelets Fun for the Summer and the Beach! Designed for working with wax models. With its additional battery, it burns hotter and gets to a higher temperature faster, so it is recommended for Chinese Knotting Cord and heavier cord such as Clown Bead Cord Tex 400. 9" (22.5 cm) long. Tired of burning your fingers with a lighter? 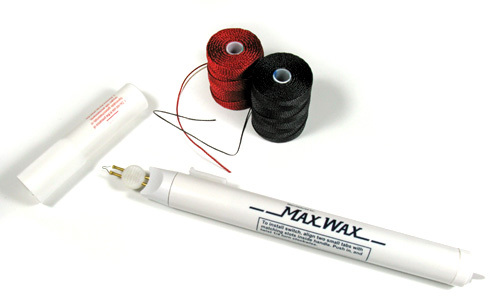 Use the best thread burner for Shambhala Bracelet and melting the ends of the Chinese Knotting Cord. Change the batteries when the tip no longer red-hot for clean melted ends! 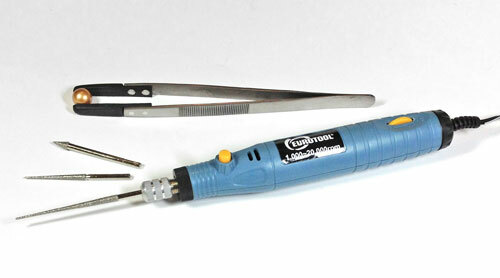 Personal note - An electrical bead reamer is a must if you plan on making lots of bracelets. Copyright Agreement: This design is an adaptation of a traditional design. Only the instructions are copyrighted, not the actual design. You welcome to make and sell as many bracelet as you wish but please understand that the instructions are for personal use only. If you would like to use these instructions to teach, either buy a set of instructions or ready made kits for each student. Do not duplicate the instructions either in print or in an electronic manner. When purchasing the kit listed above or the PDF document listed below, it is assumed that you agree with the copyright terms of this document. Thanks for understanding! About colors - While every attempt was made to reproduce colors accurately, colors on your monitor may not precisely match actual colors. Dye lots from manufacturer may vary!